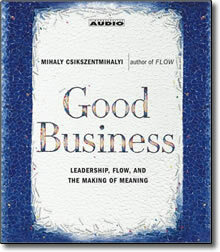 Since Mihaly Csikszentmihalyi published his groundbreaking book Flow more than a decade ago, world leaders such as Prime Minister Tony Blair and former U.S. President Bill Clinton, and influential sports figures like Super Bowl champion coach Jimmy Johnson have all been inspired by the book. In today’s corporate upheaval, a new business paradigm is evolving. While many CEOs are being exposed for their greed, truly visionary leaders believe in a goal that benefits themselves as well as others. They realize that it is their vision and “soul” that attract loyal employees willing to go above and beyond the call of corporate duty. And their employees are realizing the same thing. While 80 percent of adults claim they’d work even if they didn’t have to, the majority of them can hardly wait to leave their jobs and get home. Good Business starts with the premise that this is an age in which business and work have replaced religion and politics as central forces in contemporary life. This audiobook reveals how business leaders, managers, and employees can find their “flow” and contribute not only to their own happiness, but also to a just and evolving society. Dedication to creating a product that helps mankind. Good Business is a must-listen for anyone who values the positive contributions of individuals in the changing world of business.